Al Sharpton joins the team…..goes inside the White House…..
Al Sharpton could never resist this…..nor should he….. The guy is a genius…..he never met a camera he didn’t like….and the media simply LOVES the man! But that not the reason I like him…..
President Obama has turned to Sharpton to help him with the ‘brothers’…who want more from him……. President Barack Obama has turned to Mr. Sharpton in recent weeks to answer increasingly public criticism in the black community over his economic policy. Some black leaders are charging that the nation’s first African-American president has failed to help black communities hit hard by the downturn, leaving party strategists worried that black Democrats will become dispirited and skip November’s congressional elections. Mr. Sharpton has emerged as an important part of the White House response. On his national radio program, he is directly rebutting the president’s critics, arguing that Mr. Obama is right to craft policies aimed at lifting all Americans rather than specifically targeting blacks. One recent on-air fight with Tavis Smiley, a prominent talk show host and Obama critic, grew so heated that it has created a small sensation among black leaders. “The president does not need to get out there and do what we should be doing,” Mr. Sharpton told Mr. Smiley during the testy exchange. He argued that expecting Mr. Obama to become a “black exponent of black views” was “just stupid,” because it would create fodder for conservatives looking to defeat legislation that could ultimately help blacks. In an interview, Mr. Sharpton added that it was a “double standard” for Mr. Smiley and other critics to expect more from a black president than they would demand of a white Democratic president. Mr. Sharpton is an unlikely White House partner, given his racially polarizing history and efforts by Mr. Obama’s 2008 campaign team to steer clear of the civil-rights leader. But Mr. Sharpton could help ensure that blacks remain energized for November’s elections—an important task in a year that finds the Democratic base to be less enthusiastic about voting than are Republicans. Mr. Obama remains immensely popular with African-Americans, about 86% of whom approve of his job performance, according to a new Wall Street Journal/NBC poll. But party strategists worry that, without Mr. Obama’s name on the ballot, his personal appeal won’t be enough to motivate black voters who may feel that the government is failing them. The new poll shows a steep decline from the near 90% black voter interest in the 2008 campaign, with fewer than half now saying they are very interested in the November elections. 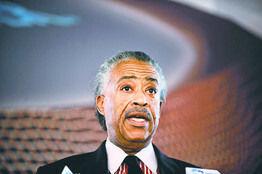 Sharpton has become an inside man….and it should suit him fine after all the bricks he’s thrown at various people in the White House….he now enters it to talk to the nation’s Presdient…what raified air he now breaths…..
Mr. Sharpton has been to the White House five times since Mr. Obama took office, most recently this month as part of a small group meeting with economics advisor Lawrence Summers. Mr. Sharpton’s radio program, which airs in 27 markets, has become a friendly platform for administration officials to address black listeners, allowing Agriculture Secretary Tom Vilsack, for example, to take credit for a recent $1.25 billion settlement with black farmers who had sued the government for discrimination. Now there are signs that Mr. Sharpton will play a role in this fall’s midterm elections. Democratic National Committee Chairman Timothy Kaine conferred with Mr. Sharpton this month on sending him to black churches and neighborhoods in politically important states to register and mobilize black voters. This from Joe Conason over @ The Observer..…. Having taken the oath of office just one year ago, Barack Obama is a flashing meteor that sputtered out too soon—or so the national media narrative tells us. According to this story line, the young president is a presumptuous liberal who disappointed his own idealistic followers while irritating everyone else. At ABC News, the leading tipsters at The Note already speak of a “final judgment,” so we may soon hear declarations of a “failed presidency” from Washington’s pundit herd. After a run of extraordinary luck that helped get him into the White House, Mr. Obama is indeed confronting his share of trouble. He may well encounter more and worse as the midterm election approaches. But he and his critics should remember the last time a Democratic president had to listen to the drafting of his own political obituary. During those exceptionally difficult years—including a historic midterm landslide that cost Democrats control of both houses of Congress—that young president heard members of his own party urging him to step aside rather than run again. Instead, he formulated the strategy and tactics that led to his decisive reelection; a smashing midterm victory in the midst of personal scandal; and a presidency that has come to be regarded by the American people as one of the most successful in the postwar era. For the moment, Mr. Obama enjoys no such reputation. His own starry-eyed supporters, who believed his rhetoric of change, are disillusioned to discover that he is a politician, not a messiah. His opponents, who once pretended to share his bipartisan instincts, are delighted to obstruct his agenda, even though they have no solutions of their own. He seems to be locked in partisan stasis despite the great mandate he won in November 2008 and the overwhelming Democratic majority. The result is that too many Americans today believe that he has accomplished little and forfeited their trust. 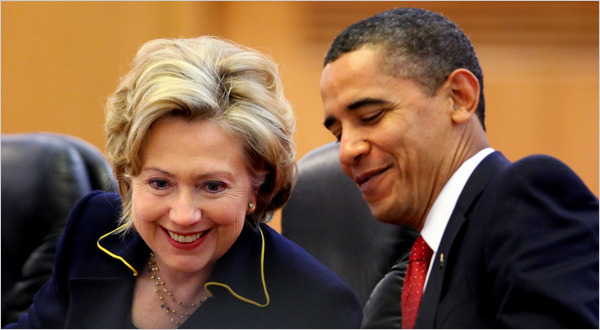 They happen to be wrong—just as they were wrong when they dismissed the Clinton presidency less than halfway into his first term. If scored by his legislative attainments, Mr. Obama is a highly effective president. In fact, the scrupulously nonpartisan Congressional Quarterly rated him the most effective president of the past five decades, as measured by Congressional votes on which he took a position, either yea or nay. When he enunciated a clear position in the House and Senate, his success rate was 96.7 percent—a number that surpassed the previous records held by Lyndon Baines Johnson and Dwight Eisenhower. If scored by his campaign promises, Mr. Obama also wins high marks. That judgment also comes from a respected nonpartisan source, the Pulitzer Prize–winning political Web site known as Politifact.com. Tracking in detail the progress of 500 policy pledges made during the 2008 campaign, Politifact has assembled an “Obameter” that rates each promise as kept, broken, compromised or “in the works.” Their finding is that he has made good on 91 promises so far and broken only 14; 275 are in the works, meaning that he is seeking to fulfill them, and 87 are stalled, which indicates little progress. For a president who has yet to complete his first year, those are not only decent ratings but a strong indication of good faith. Still, Mr. Obama’s approval ratings have fallen sharply, and his party seems headed for a midterm spanking. Those declines are partly cyclical and normal, and partly the fallout from economic and military conditions that he inherited after nearly a decade of Republican misrule. But they are also owed in part to his administration’s mistakes, in pursuing a stimulus program that was too small and scattered, and a health care reform that is too compromised and timid. But for now he also suffers the lagging effect of his legislative successes (including health care, if it finally passes), which voters will not feel until many months from now.